Yes! I love Stride Rite shoes. We usually go in to one of their stores in the spring and fall/winter to get my kiddo's feet measured and the half-sizes come in so handy. They keep the running list of shoe sizes at the stores for you too. And I usually browse the sale shoes. ;) Gotta keep the costs down. 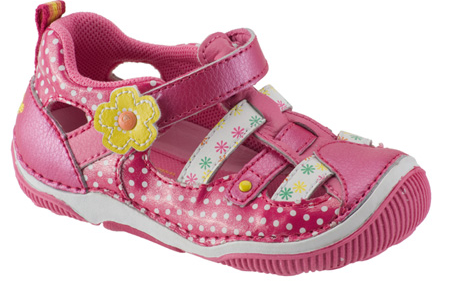 We too like Stride Rite Shoes. I also shop the sale and clearance in hopes of a great snag. Almost any pair that fit are a great snag actually cus their styles are great. I love Stride Rites, I think they are the best shoe for new walkers! Will be using these when my baby starts to walk. I just found this review because i've been researching what are the best shoes for my baby boy...i was in between stride rite and another company for my baby's first shoes and I love that these shoes are so great for babies when they first start to walk. Thanks for your review!